Memorial Page – We Adopt Greyhounds, Inc.
My husband and I wanted to share this beautiful photo and give you a quick update on Xander. We adopted Xander about 3 almost 4 years ago. Sadly, Xander has crossed the rainbow bridge this past Sunday unexpectedly. He had an amazing retirement from the racetrack at home. He became a guardian over our 4 month old baby girl who he loved dearly. We are heartbroken over his loss. But are so happy we got the honor of adopting such a wonderful, sweet and loving dog. He will be missed and will always carry a special place in our hearts forever. We adopted Jake from Paul Botticello in South Windsor in 2002. 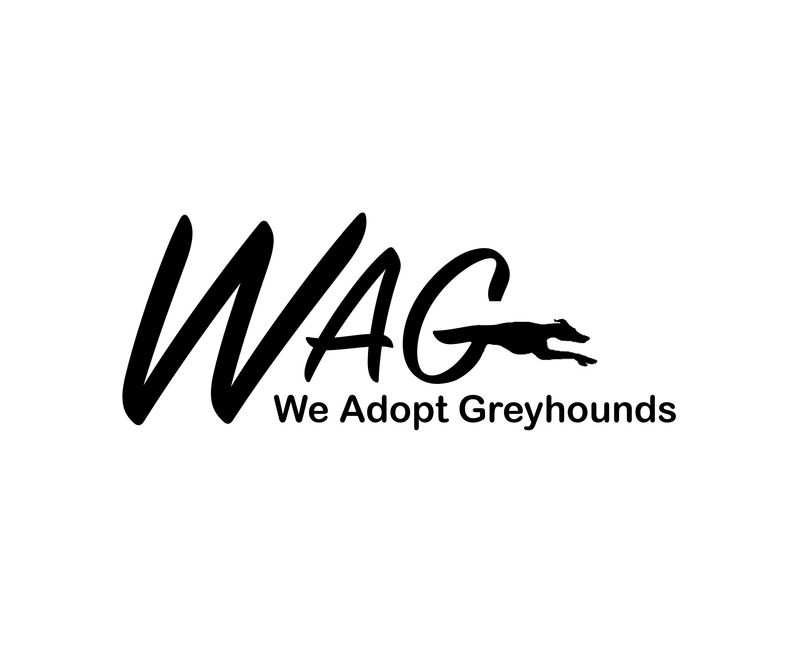 We adopted several greyhounds thru Paul as WAG and before when he supported Regap. Sorry to have read of his passing. I last saw him a couple of years ago and dementia was taking him over. He didn’t remember or respond to Jake. He used to board our greyhounds when we went away. A truly wonderful man. Sad to lose Jake, but it was time and we suspected bone cancer in his right front elbow was causing him discomfort so it was time – doesn’t make it any easier. 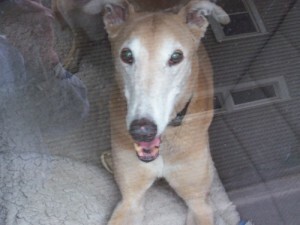 Jake Claydon, faithful companion, friend and retired greyhound, was humanely euthanized on October 24, 2014 due to the infirmities of old age and suspected bone cancer. Jake was 14 1/2 years of age and was in declining health over the last several months. Jake lived out his final days pain free and content, though no longer able to attend to his daily walks or climb stairs. He ate well, enjoyed lounging in the sunlight and visiting the dinner table for any gifts or morsels offered his way. His last meal included a slice of birthday cake which he much enjoyed. Jake was born on May 7, 2000 and was given the racing name Sav’s Top Cop . He raced 13 times at the now defunct Plainfield Greyhound Park with a record of one win, one second, and 4 thirds. He was retired early likely from a racing related injury. Jake was one of 7 litter mates, 2 males and 5 females including his sister, Sav’s Dragnet who won 9 of 78 of her lifetime races, a testament to durability and good luck; Sav’s Lineup who won once in 21 races, and 4 siblings who did not race including his sister, Sav’s Radar, pictured below who could pass as a double for Jake. 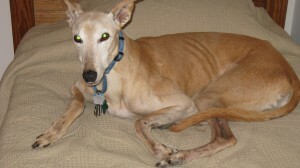 Jake’s long time companion, Abby Claydon, predeceased him in 2011. Jake was a very timid and shy fellow who emerged eventually into an inquisitive guy who would come forth to check you out with a sniff, or was just looking for a pat on the head (or better yet a small treat). Jake was a super house dog who learned to bark to alert you that he needed go out (nary an accident and when it happened, it was usually our fault) and at a much later date he learned to drink (or resorted to) from the toilet, if his water bowl was empty. Jake enjoying a piece of steak with Abby nosing in from the other side. Jake in his younger years with sad looks but really a happy boy! 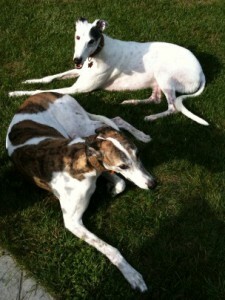 Abby Claydon, beloved companion and retired professional racing greyhound, died peacefully at home on January 1, 2011 due to infirmities of old age. She was 14 ½ years of age. The fawn daughter of John Levi and Deluxe Fantasy was born July 2, 1996 and was the litter mate to sister Touchdown Kid and brother Jazzy Sax. Their whereabouts are unknown. 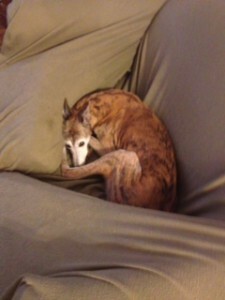 Abby was an accomplished racer performing at Plainfield Greyhound Park in Plainfield, Connecticut until her retirement at age 4. She lived in Marlborough and Ellington, Connecticut and summered at Saratoga Springs, New York during the summer racing season, though never actually attending the races. 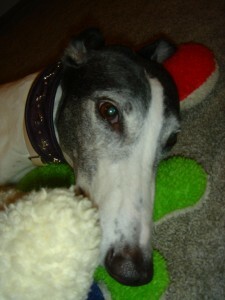 She is survived by long time companion, Jake Claydon, also a retired former racing greyhound. She enjoyed lounging in the sun, sleeping on the bed and working the crowd for any scraps or handouts available. Her key to longevity was her daily walks, keeping the weight off, and good luck. Here is our girl, we had Fanny for 12 years before she passed over the Rainbow Bridge! We always felt that she was meant for us because early on she had bladder control issues! We just said, that’s what we got a steam cleaner for. We loved our girl very much and we will miss her! She was a great companion not only to us but our other dogs. Run wild and free with your GMan. Tater was by far an extremely loving, protective family member. Although he was very playful, loved to lie in the summer grass, and destroy the living daylights out of every squeaky-plush toy in the house, ‘Tatie’ would often growl at any other dog, chase kitties, and be unfriendly towards little kids and strangers-always there to protect us. 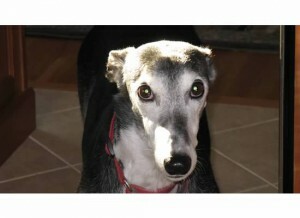 When we first got Tater, he was in a small group of greyt greys. Right from the start, the youngest in the family knew he was the one-goofy grin, sweet eyes…. Our boy was a two year old who’d just gotten out of a cast, mending a broken hock. His name was Andy at the time. I wanted his name to be Monty, but then the name was quickly voted out in favor of ‘Tater’. Our puppy had a lot of medical issues-got diarrhea and vomit when he ate different types of bones, thyroid issues, and a cut on his bum that almost needed stitches (due to accidentally getting caught on a stick). When our boy was nine, he suffered quite a few ruptured back discs and needed surgery. 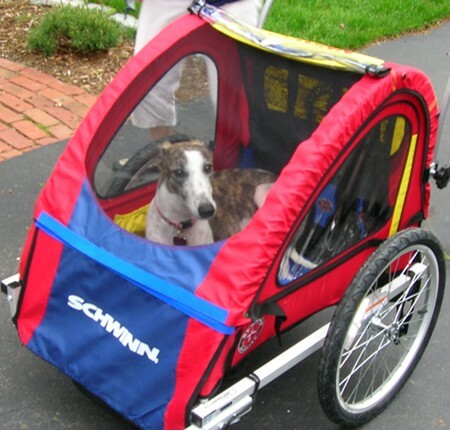 Since the condition was so rare in large dogs, particularly greyhounds, there were only bits of hope to cling onto. But, Tater wasn’t one who would just give up-he bounced right back and returned home within a matter of days; way before any surgeon would believe. By then, we all had to pitch in on the ever increasing price in vet bills. Sure, our giant cow of a grey still walked a bit crooked for the rest of his life, but he was as cute and cuddly as ever. Finally, almost exactly a year later (after Thanksgiving), Tater ruptured another few discs (creepy, huh?). Due to several complications, Tater stayed for a bit more than a week when he was finally eating, sitting up properly, and drinking. The vets had just signed his release forms for him to go home the next day when he had a heart attack, blood clot, or who knows else? Our puppy was gone. It was a very depressing time for the whole family-we really believed that he would return home, pull through again, when he was gone. Tater, you will never be forgotten and we will see you again as a frisky, young, healthy pup on the other side of the Rainbows Bridge. Piglet’s journey on earth has come to an end. A message from Rebecca. The side effects from the needed medications for the erosive poly-arthritis have taken a final toll on her. Caring for her has been a true labor of love, and she will always have a special place in my heart. I will cherish the memories of the things she enjoyed most in her short life, playing with toys, basking in the sun and riding in her ‘chariot’. My family and I would like to extend our heartfelt gratitude to WAG for supporting her since the moment she was carried off the hauler on August 19, 2008. The cost of her veterinary care has been extraordinary, but Piglet has received the very best care with Dr. Perry, and was also seen by several other specialists over the past two years. We would like to thank everyone who made financial contributions for her care, sent pajamas, coats, medications and toys, some of whom we’ve never even met. We were also very appreciative when our pastor friend Kate came to the house last spring to give Piglet a special blessing. 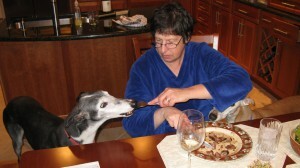 The outpouring of care and concern for her from the greyhound community and beyond truly warms my heart. Based on her condition when she arrived at 15 months old, it’s likely she never had the beautifully muscled greyhound body that is built for speed. While she had a lot of spirit, the disease made running virtually impossible as it crippled her body and significantly reduced her mobility. So it is my eternal hope that as she drew her last breath with us, her body began to heal and her strength could finally match her spirit and enable her body to do what it was meant to do ~ run like the wind until her heart’s content. Graceful, lithe, and regal, Snazzy came into our home and our hearts in July of 2005. Her sweet nature and loving disposition endeared her to our family, friends, and neighbors. Snazzy loved to travel, and she went on every roadtrip with us. She loved little dogs, tolerated our cats and despised thunderstorms and fireworks. She’d often “help” me in the garden by following along, digging up the flowers that I just planted. She loved peanut butter cookies and belly rubs. She also enjoyed a good book now and then—chewing it, not reading it! She was my special friend, always sleeping with me, well in truth, letting ME sleep with her! She will have a place in my heart forever, my Snazzy-girl, my baby. Our beloved greyhound, Rico (a.k.a. 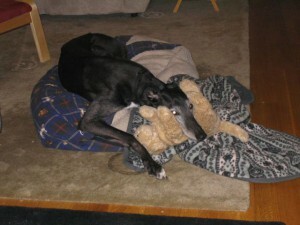 WillyWonka, born 06/06/01), passed over the Rainbow Bridge on 05/22/10, where he joined our first greyhound, Mac (a.k.a. S.R. Nekko 03/09/98-08/06/04). 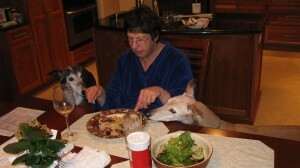 Rico (white greyhound at top of picture) is greatly missed and will forever be remembered as the great lover of people. Rico was always looking for a pet or hug from anyone. He loved playing with his toys and playing with his “brother”, Riley (a.k.a. Fanatic Error, born 04/25/02), the brindled greyhound at the bottom of the picture. Riley is lost without his favorite buddy and playmate. Rico loved to chase Riley in the backyard, loved to go for walks and didn’t even mind rides in the car. we always made a comfortable spot for him in the bathroom where he hid during thunderstorms. Rico was always as close to Riley as he could be…many times basically sleeping on top of each other. 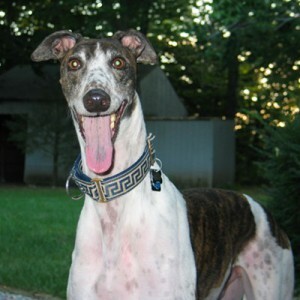 Rico was an amazingly strong greyhound, bravely dealing with the loss of part of his foot due to a cancer cyst in January of 2007. Later, though, the cancer was back and ultimately took over his life. Through it all, he was still the happiest greyhound and pet! He, happily, is no longer suffering…playing with all the other pets over Rainbow Bridge. My husband and I, along with Riley, miss him dearly, but know that one day we will all be together again. We love you, Rico! He was a good friend and faithful companion. He especially loved his puppy (as shown) which he loved to use as a pillow and toss in the air when he was feeling playful. Jesse was very calm and placid except during thunder storms when he would shake and quiver and his nose would dribble all round the house. There are a few places where the metal baseboard heating has nearly rusted through! Jesse enjoyed traveling in the car and would love to go hiking. He once climbed up a high ridge with me where there was a lovely view at the top. He couldn’t believe his eyes that the world came with a view and was quite startled when he looked at the valley with houses below him. Jesse was wonderful with Ian, our baby boy and was gentle and tolerant and seemed to know that Ian was a “puppy”. Ajax, formerly known as ‘Rancho Picopop”, has died just short of age 14 – he died on Sunday August 23, 2009 at 5:30 in the morning. He was born in November of 1995, and adopted in June of 1998. When I went to the kennel to adopt him, the ever wonderful Paul was dealing with an outbreak of dogs with kennel sickness, and Ajax was the only dog cleared for adoption – he came racing out of Paul’s kennel, a giant vital red dog compared to the 3 lovely fey girls I had adopted previously, and ran right up and nuzzled me, jumping off the ground a foot into the air with excitement. It was instant love and affection between us, although we did discuss who was REALLY the Alpha dog from that moment on – but he was always a gentleman and elegant in his attitude. He was a wonderful pet living with me for almost 11 years, the fourth in a line of Greyhounds that stretches back for 25 years in my same little house. Always very strong, with age his sight had dimmed, his step had slowed, and his hearing had diminished, but his capacity for love and affection had only grown through the years. The burden of daily life had grown too heavy for him, and he died very quietly, paw in my hand, just slipping away as dawn was breaking. He had numerous friends and was a constant presence on my street – everyone who met him loved him, even non-dog people – he had numerous dog friends as well. He was a tremendous public ambassador for Greyhound rescue, and was responsible for 3 adoptions (that I know of – perhaps more) from WAG. He was active in the Winsted CT pet parade until last year, often marching alongside other adopted Greyhounds and at least one Italian Greyhound and a Whippet. He was a friend to the now departed Noel the Cat, who died in March of this year at the age of 24 – Noel had been witness to, and friend of, all 4 of my Greyhounds, and each of them treated him with respect, and at times, grudging affection. He will be missed, but I know he is romping at the bridge with the girls and Noel (who left early to introduce them all to each other I think). A great dog, with a fantastic attitude who was always there for me – I am happy that I was able to be there for him too – being unemployed since mid March, I was able to provide almost everything he needed in his final months, when he needed companionship and help the most. He was a wonderful dog, a friend and boon companion till the end. David Hoover – proud owner and friend to Susan, Zelda, Blanche, and Ajax the Greyhounds, friends in life, and always with me in my heart, until we all meet again. Gus Grisum was born on August 7th, 1997. My wife rescued Gus in 2001 and took care of him until his passing on May 31st, 2009. My first memories are of him in my wife’s small apartment before we were married – he once got into some red food coloring and it looked like a scene from CSI. I remember the “happy tail” events – Gus was very happy to meet you at the door and brighten your day. My wife and Gus eventually moved in to my home where I had a nicely manicured lawn that quickly turned into a greyhound race-track. Gus also found ways out of the yard as he was determined to mark his territory in other neighborhoods. I remember him bringing us his dinner in our living room while he ate. I remember the velvety ears that he loved to have rubbed. No other dog loved being tucked in more than Gus. He would also position his body to maximize sun exposure. 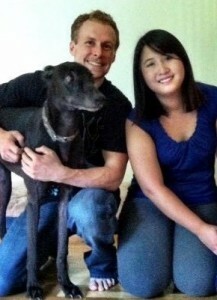 We rescued another grey – enter Pat C Betsy (aka Patti). Gus and Patti turned into the best of friends. She followed him around like any little sister would a big brother. Patti would try to get Gusman to run and play with her in the yard, but he never really wanted to and let her know that – but she still persisted. The best memories of Patti and Gusman together are of their howling sessions. You never heard a peep out of Gus until Patti got him to howl – to this day when Patti howls I can still hear Gusman in background. As time went on Gus had a harder time and it seemed he had a lost a step. We knew he was getting older and we feared we were getting close to the time where we would have to say goodbye. We moved to a bigger house in March 2009 and the new place rejuvenated him. It took him a few weeks to figure out which turns to take, but Gus’ love of lying in the sun meant that the sun porch was “his room”. He would run to the porch when he realized that the door was open. The memory of the joy in is trot still brings a big smile to my face. He also had to sprint up his hill while walking around the yard. My most vivid memory of Gusman is not one but all of my memories of his graceful gait. I cannot say I have seen a more regal or graceful dog in my life. He had something about him that exuded a kingly stature – for this I had absolute respect for him. We will miss him for the rest of our lives and we promise to hold onto the memories that we shared with one very regal, graceful, and retired greyhound – our irreplaceable Gus “Gusman” Grisum…we love you Gus!